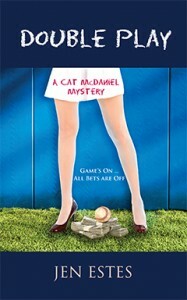 Double Play follows Curveball as Book 3 of the Cat McDaniel Mysteries, also known as the Foul Ball series. The series began with Big Leagues. Team reporter Cat finally has her perfect lineup in Double Play. She’s reporting for the playoff-bound Buffalo Soldiers, she’s living large in a two-bedroom loft overlooking the Niagara River, and she’s sporting a diamond on her ring finger—nowhere as big as a baseball diamond, but big enough for her. Just when Cat seems to be on top of her game, life throws her an off-speed pitch. A screwball clad in a leather jacket and biker boots—also known as her half-brother and full-leech, Quinn—shows up on her doorstep, or more accurately, her balcony. Her fiancé, Benji, although shocked to find out he has a future brother-in-law, welcomes the flighty Quinn, little knowing what havoc the man’s boozing and betting ways will wreak on their lives. Soon after Quinn moves in, Cat’s team’s innings become his fat winnings. As the long shots turn into locks and hundreds turn into thousands, Cat’s curiosity steps up to the plate. Between the betting lines, she finds greedy gamesters, desperate ballplayers and an enterprising bookie looking to raise the stakes. Sometimes baseball isn’t just a game, it’s a matter of life or death. Born and raised in Illinois, Jen Estes started her writing career as a baseball blogger in 2007 and expanded to freelance sports writing in 2009. She is an active member of the Society of American Baseball Research (SABR), Springfield Poets & Writers and the National Writers Union (NWU). When Jen isn’t writing, she enjoys running, yoga, traveling and watching baseball with her husband and cat. Click here to find Jen on the Web or go to her blog. Follow her on Twitter @jenestesdotcom. She didn’t know how long she’d been asleep when the scream tore through the dark bedroom and smacked her awake. Benji’s eyes snapped open, too. Simultaneously, they threw the comforter off and shot out to the hallway, hurrying into the living room. The remnants of the poker night were still visible, cards and beer bottles scattered over the table. The chairs were empty and her eyes darted to the balcony. The sliding glass door was wide open and a cold breeze blew through the room. The players all gathered near the edge. Cat sprinted to the balcony. She breathed a momentary sigh of relief when she saw her brother in the corner, disguised by Benji’s spiraled boxwood topiary. “That’s got to be Finley again,” Benji said, turning around to answer it. Joel turned around and shoved past her, running into the kitchen. She heard him wretch and hoped he had made it to the sink. Slowly, she began to recall the guests from earlier. Joel Faulk’s in the kitchen. No one answered her. She cringed as she finally made it to the edge and followed their gazes to the ground. A twisted body lay on the grass two stories down. It wasn’t Spencer. Her friend was short and this figure spanned two sidewalk lengths. She recognized his shaggy, dirty blond hair immediately. Now she remembered him from earlier. The pitcher had sat on the loveseat, next to Adam. He’d made the “your mama” joke. Benji rushed to the balcony and looked over her shoulder. He gasped. Benji nodded and ran to the phone. His body still didn’t move. She pushed past Adam and ran out of the apartment. Her hand glided down the railing as she shot down the three flights of stairs. She sprinted across the grass. The blades felt like porcupine quills under her bare feet and the ground was cold and wet with frost. She reached his body and looked up at her lighted balcony. Quinn and the players were no longer there but she could see Benji pacing back and forth in the living room, the cordless phone pressed against his ear. She tore her eyes back to Ryan’s contorted body.